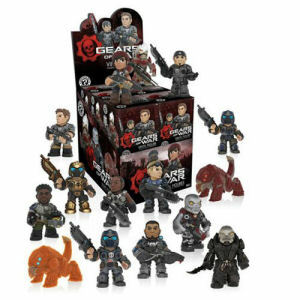 We have Just Sold out of Gears of War Series 1 Mystery Minis Mini-Figure Master Carton. Not to Worry! Fill in the Notify me When Available and you will be the first in line for our restock of Gears of War Series 1 Mystery Minis Mini-Figure Master Carton !! From the Gears of War collection by Funko. Gears of War Series 1 Mystery Minis Mini-Figure Master Carton. Case contains 72 individually blind packaged mini-figures. Marcus Fenix - Augustus Cole - Damon Baird - Clayton Carmine - Kait Diaz - Del Walker - JD Fenix - General RAAM - Locust Drone. Measure 2.5 inches tall. Funko Gears of War Figurines shipping from Canada. No Surprise Border fees or Customs!